AC Train Travel on LTC Air Travel on LTC CCS (LTC) Rules Clarification on LTC FAQ on LTC LTC LTC 80 Scheme LTC Encashment LTC to NER LTC - Will Air Travel Continue for the Next 2 Years? LTC - Will Air Travel Continue for the Next 2 Years? Will Air Travel Continue for the Next 2 Years? For a number of years, Central Government employees have been enjoying the benefits of Leave Travel Concession (LTC). When a Central Government employee is employed at a place that is not his home town, then, once every two years or twice every four years, he/she is eligible to reimburse the travel expenses incurred for travelling to and back, along with the entire family. A BLOCK YEAR consists of four years. The current block year runs from 2010 to 2013. This is divided into two – 2010-11 and 2012-13, and concession to travel to the home town is offered twice. Instead of two trips to home town, the employee is eligible to convert one of them as ALL INDIA LTC concession. Those who haven’t availed of the concession of the 2012-13 year block can utilize it in 2014. Depending on their designation, the employees are eligible to utilize air, ship, rail and road transportation facilities, along with the travel class. This wonderful opportunity will draw to a close very soon. The Government has issued permission to travel by air to the NORTH-EAST REGION until 30.04.2014 and to JAMMU & KASHMIR until 17.06.2014. Question is – Will this concession be extended for the next two years? 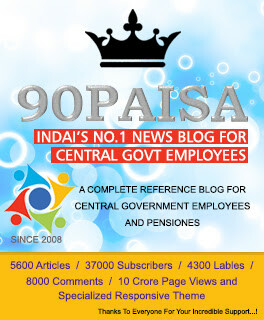 Any latest orders and news about Pay hike for Central Govt Employees, as and when received, will be updated in our Timeline...Join today..! what if a candidate was posted with grade pay 2400 from 2010 to 2013 and he is now posted in 4600 grade pay. he changed his department with technical resignation . if he did not avail home town LTC and all india LTC even a single time. Is he eligible for All India LTC in 2014 for the past block year 2010-2013. NOT ONLY EXTENSION OF AIR TRAVEL TO J&K AND NORTH EAST BEYOND 17.6.2014 & 30.4.2014 RESPECTIVELY BUT ALSO EXTENSION OF AVAILING TIME OF THE BLOCK YEAR 2010-2013 BEYOND 31.12.2014, JUST A ONE TIME GESTURE MEASURE TO THE UNAVAILED STAFF (FOR VARIOUS REASONS) ON THE OCCASION OF NEW GOVT ASSUMED IN OFFICE. THANKS! I want to know that can central govt employees can travel to NER by pvt airlines? i have availed hometown ltc in the year 2012(block of two years 2010-11 extended upto2012).now i want to avail all india ltc in block of four years 2010-2013, extended upto dec.2014, whether i m entitled for this?pl.clarify.our acao/pao expressed that i m not entitled to avail ltc in extended period. What is the age of dependent son to avail ltc? For air travel, within how many days after getting the advance i have to travel? Please let me know, whether conversion of home town ltc to visit J&K is presently available to central government employees. I joined in central government in 1987 and resigned in 1991. Later joined in central public sector until 2014.Rejoined in central government in 2014. Can I avail the fresh recruit rules for LTC applicable for first 8 years in respect of remaining four years from 2014. Please clarify.